Disney proudly presents the 50th anniversary edition of a spellbinding and beloved animated classic. 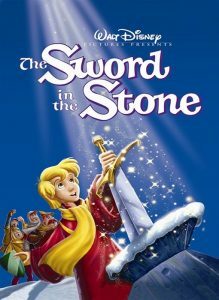 Conjure up magical family fun with the humor and adventure of The Sword in the Stone on Blu-ray Combo Pack! Take an amazing journey with a young orphan named “Wart” and the extraordinary wizard Merlin. According to legend, only someone with the purest character and inner strength can pull the enchanted sword from the stone and claim the throne of England. Armed with newfound confidence and the power of friendship, Wart discovers his destiny and learns the best magic is the kind you find inside yourself!